FolderMill can automatically print over 38 popular types of files using Hot Folders. All you need to do is create a Hot Folder, add “Print Document” Action, select a printer and place your documents into Incoming folder. Your files will be instantly processed and printed out. In this article, however, we will elaborate on more specific printing tasks. We have many users connected to the printer through a wireless LAN. The users print different types of PDF files. The problem is there is no way to set the number of copies we want. Now we print e.g. 1700 labels in a row to create a multi-page PDF with all the copies in it, but that works very slow. Can we make Foldermill print the document x times automatically, for example by adding the number at the end of the document name? Yes you can! With FolderMill you can control how many copies of a specific document you want to have printed and even what printer tray (paper source) should be used. Also, you can apply other file printing parameters - by setting them directly in the filename of each file. Create a new Hot Folder and add “Print Document” Action. Here you should set all needed settings, including number of copies that will be used by default. These options will be used for all incoming files. However, you can also modify individual print settings for certain documents on the fly directly in their filename. Individual print settings indicated in filename will take priority over Action’s settings. This will let Foldermill automatically print 10 copies of this particular document. 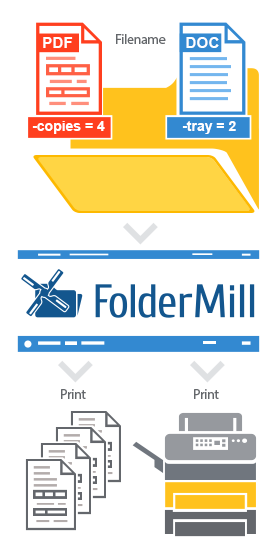 Select printer tray (paper source) for this document. To define it, use your printer tray ID number. Select paper type and size for this document. To define it, use a specific paper type ID number. Please note: this option works for Hewlett-Packard (HP) printers only. NOTE: if you don’t know your printer’s printer type ID or paper type ID numbers, you may use PrintCheckTools utility, which is located in your FolderMill program folder. If you cannot find it (in old versions of FolderMill it is absent), please contact us - we will help you! Thus, you can use FolderMill to facilitate printing within your company. No need to change general print settings every time - just set the number of copies and other printing options (double-sided printing, printer tray and paper type) in the filename of each individual file! If you have any questions or issues on features described here, please contact us.